Run SharePoint on AWS to rapidly deploy and scale your collaboration platform. Take advantage of the benefits that the AWS cloud offers such as pay-as-you-go pricing, scalability, and data integrity to run your SharePoint workloads today. AWS provides options for using existing Microsoft licenses. Learn more about how you can bring your own licenses to the AWS cloud. If you have questions about AWS for SharePoint please visit the FAQ page. This reference guide deploys Microsoft SharePoint Server 2016 in a highly available architecture on the AWS cloud. The implementation includes a Microsoft Active Directory Domain Services (AD DS) infrastructure, Microsoft SQL Server 2012 or 2014 instances configured in a Windows Server Failover Cluster (WSFC), and multiple Amazon EC2 instances to participate in the Microsoft SharePoint Server 2016 farm. The Quick Start supports both traditional and streamlined topologies. 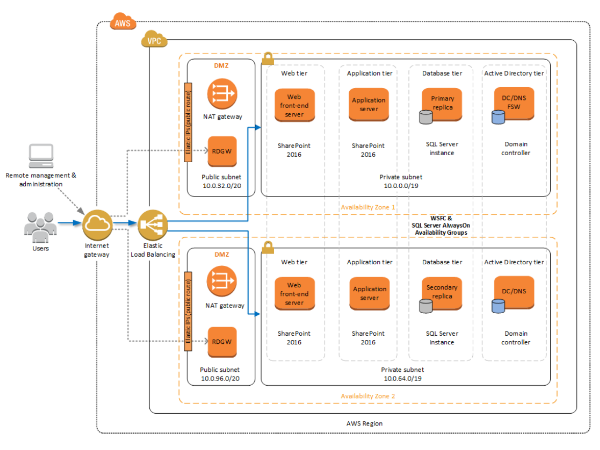 Rapidly deploy and scale SharePoint Enterprise solutions on AWS. You have a choice of several versions with options for size, payment, licensing, and type of deployment. Available as a single AMI or a CloudFormation template that defines a starter architecture with features for redundancy, scaling, and load balancing built in. Get started today to take advantage of popular SharePoint Enterprise features like enterprise search, workflow management, mobility support, social integration, business intelligence, advanced document management and more. The Basic version is even available as a 30-day free trial! Running SharePoint on the AWS cloud allows you to add capacity as needed, without long lead time. You can easily scale up, or down, as business demands change. Stay ahead of the curve by adjusting capacity in minutes and hours, not days or weeks. AWS offers low, pay-as-you-go pricing, which eliminates hardware acquisition costs and allows you to pay only for the capacity you need. We do all of the hardware management, so you can focus on higher-value activities than replacing hard drives. While reducing both. You no longer need to plan, procure, manage, and depreciate your IT infrastructure. You can replace large up-front expenses with more predictable costs that scale with your business. By using AWS, Slalom upgraded to SharePoint 2013 and used Direct Connect to enable dedicated network connections to its on-premises data centers. Running on the AWS cloud helps Slalom take advantage of new SharePoint features while saving an average of 14% compared to its previous cloud provider. Are you interested in running Microsoft SharePoint on AWS, and would like to have an AWS Sales Representative follow-up with you about your IT project? Please contact us.